In order to get an accurate grid Zn for daytime grid entry, the navigator must compute Zn of the sun for a time and geographic position where the grid navigation leg begins. If the geographic position for grid entry is known well in advance, you can prepare a Zn graph for a time window. A Zn graph makes grid entry easier, because it is usable for an extended period of time, therefore eliminating the need to precomp for a specific time. 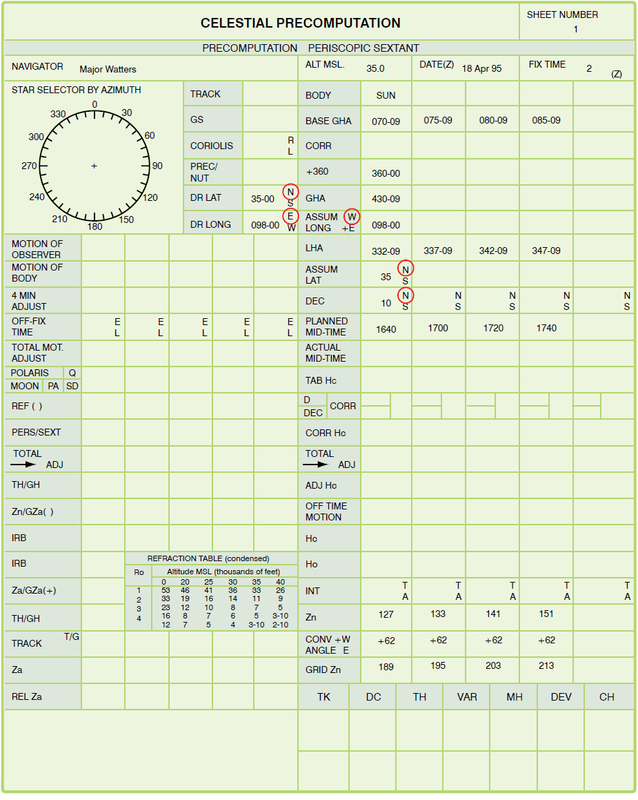 The graph can be constructed during flight planning, thus reducing workload in the air. To construct the graph, precomp and plot Zn on one axis and time on the other. [Figure 14-15] Set up the time axis to cover the planned start time and several minutes earlier and later. Plot grid Zn on the other axis using normal precomp procedures and the start point coordinates. Because the time/ Zn slope is close to linear, precomping at 20–30 minute intervals and connecting the points gives acceptable accuracy. When the sun is near local noon, precomp Zn at closer intervals because the Zn changes rapidly. 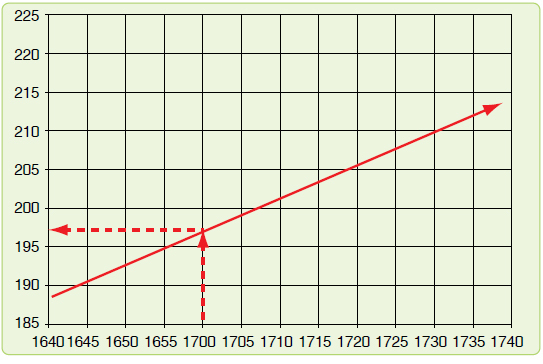 To use the graph when it is finished, enter on the time axis. Then extend a line perpendicular to the time axis until reaching the time/Zn line. Finally, read the appropriate Zn on the Zn axis. Figure 14-15 demonstrates using a graph to get a grid Zn for the time of 1700Z. Although preparing a Zn graph takes a while, it pays dividends as long as you actually fly over the planned geographic point within the time frame covered by the graph. The most accurate method for applying precession to the DR is the all behind/half ahead method. This method corrects for the banana effect most commonly associated with precession. Since the full effect of precession does not occur at one time, we have to account for the gradual increase of precession. In Figure 14-16, grid entry occurred at 1700. At 1720, the navigator obtained a heading shot or MPP. The heading shot determined precession correction to be –2 and the compass was reset to the GH. On the MB-4 computer, place the –2 correction on the outside scale and the time since grid entry (20 minutes) on the inside scale. The hourly rate now appears above the index (6.0R). To minimize error, the hourly rate has to be computed to the nearest tenth of a degree. Since precession begins at the last time the gyro was reset, for this example we need to start at grid entry 1700. At 1700, all behind would be determined to be 0 minutes and halfahead to the next dead reckoning (DR) (1706) would be 3 minutes. To determine the amount of precession correction to be used, leave the hourly rate (6.0) over the index and look above 3 minutes. The computed precession correction for the 1706 DR is –0.3° or 0 for use on the log. Next, we need to determine the precession correction for the 1720 DR. At 1706, all behind is 6 minutes and half ahead is 7 minutes. The total time used to compute the precession correction for this DR is 13 minutes. Again, using the hourly rate, precession correction for the 1720 DR is –1.3° or –1° for the log. Since the all behind/half ahead method tends to keep you behind, the KC-135 method is used by some navigators to predict precession. This method basically uses half of the computed precession correction for future DRs/MPPs when the precession correction is determined between two positions. Though not as accurate as the all behind/half ahead method, the KC-135 method can be effective if used with short DRs. Using the KC-135 method, compensate for precession around the turn by getting a heading shot immediately before and after the turn, resetting the gyro after the heading shot restarts precession. A second method of compensating for precession while inflight involves the use of false latitude inputs into the gyro compass. Most gyro compasses have a latitude control that allows the navigator to compensate for earth rate precession (ERP). Normally, the latitude control is set to the actual latitude of the aircraft. However, other values may be set. For example, if the aircraft is at 30° N and the latitude control knob is set to 70° N, the gyro overcorrects for ERP. Since ERP is right in the Northern Hemisphere, the correction is to the left. Thus, setting a higher than actual latitude corrects for right precession over and above that for ERP. Since ERP 1 5°/hour × sine latitude, a table such as in Figure 14-17 can be developed to use this procedure. Figure 14-17. False latitude correction table.